Slavia-Sparta game marred by refereeing error that “makes mockery” of football; Plzeň match also contains dubious VAR conclusion; no third Extraliga title in row for Kometa Brno; and Berdych slips as Czech number one after nine years. Slavia Prague - Sparta Prague, photo: ČTK/Michal Kamaryt With only two rounds remaining in the regular season of Czech soccer’s top flight, Slavia Prague remain five points clear following a 1:1 draw at home with rivals Sparta Prague on Sunday. Slavia took the lead in the first half thanks to a header from Tomáš Souček before the visitors equalised through a wonderful strike from Srdjan Plavšič. 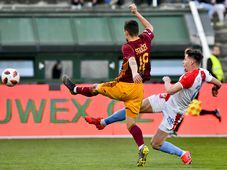 However, most attention was focused on a 12th-minute foul on Josef Hušbauer by Sparta goalkeeper Florin Nita for which Slavia should have been awarded a penalty but instead saw their player receive a yellow card. 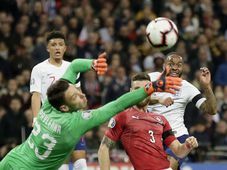 Referee Karel Hrubeš later admitted he had made a mistake in not pointing to the spot kick, saying he had seen angles afterwards that were not available to him during the in-game VAR review. Hušbauer was distinctly unimpressed when he spoke to reporters. The weekend’s action in general was not a great advertisement for the Czech game or technology. A questionable offside decision, which was also approved after a VAR review, helped second-placed Viktoria Plzeň keep the pressure on Slavia with a 2:1 victory over Baník Ostrava. Kometa Brno - Bílí Tygři Liberec, photo: ČTK/Václav Šálek Kometa Brno will not be able to lift the Czech ice hockey Extraliga title for the third time in succession after being knocked out in the playoff semi-finals. They lost 3:1 to Liberec on Saturday to give their opponents a 4:2 victory in the best-of-seven series. Plzeň pushed the other semi-final to a seventh match with a 3:1 victory over Třinec that left them tied on 3:3 on games. That showdown takes place on Monday evening, after the recording of our programme. For the first time in nine years, Tomáš Berdych is not the Czech men’s tennis number one. The 33-year-old, who is currently out with a back injury, is now 98th in the world rankings, behind his compatriot Jiří Veselý in 95th. Back in 2010 Berdych had replaced Radek Štěpánek as the top Czech men’s player. The Czech javelin great Barbora Špotáková says she is focusing her energies on reaching Tokyo next year for what would be her fifth appearance at an Olympic Games. Now aged 38 and with two children, the double Olympic champion and world record holder told reporters on Saturday that her first appearance of 2019 would be at a Diamond League meeting in Rome in June.